A shot from the ad. A new Mark Schauer for governor political advertisement features four teachers from four different school districts who claim that Gov. 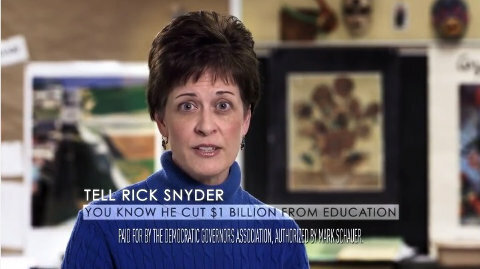 Rick Snyder has cut funding to their districts. But in fact, on a per-student basis, all four districts actually received more taxpayer money in 2013-14 than they did in 2010-2011, which was the last budget approved by Gov. Jennifer Granholm. The ad features seven teachers but only four specifically cite lower funding. For months Schauer, who is the Democratic candidate for the state’s top office, has claimed that Gov. Snyder cut funding to public schools. This claim has been refuted by several sources. Specifically, this week Detroit Free Press reporter Paul Egan fact-checked and found "truthful" a political ad by Gov. Snyder denying that his administration cut $1 billion from public education. Egan added, “That's more than can be said for the education funding stories told in ads sponsored by Democratic candidate Mark Schauer and the Democratic Governors Association." The teachers in the Schauer ad referred to above are employed by Lincoln Consolidated Schools, Ann Arbor Public Schools, Novi Community Schools and the Plymouth Education Center charter public school. All four claim in the ad that their schools are getting less money today under Gov. Snyder. Yet the three conventional school districts and one charter school each received more state dollars per student in 2013-14 than in 2010-11 according to the Michigan Department of Education. State funding for Michigan public schools is complex. It contains several different components and is also tied to student enrollment numbers. Novi High School teacher Chandra Madafferi is one of the individuals in the Schauer ad. She recently testified at a Senate hearing on behalf of the Michigan Education Association, the state’s largest teacher union. In the ad, Madafferi responds to a question about whether Gov. Snyderincreased funding to schools. “Definitely not mine,” she answers. That answer would be accurate if it referred to just one particular part of state funding — the “per-pupil foundation allowance” — but is false for overall state funding. Adding to the potential for confusion, the foundation allowance is actually a mixture of state and local funds. Looking at just state dollars — not federal or local money — Novi Community Schools received $6,404 per student in 2013-14, which is about $1,000 more per student than the $5,411 it received in 2010-11. Overall, the district received $34.1 million in state dollars in 2010-11, with 6,315 students enrolled, and $41.3 million in 2013-14, with 6,443 students enrolled. These state dollars are divided into several pots, including the state’s contribution to the foundation allowance, money for school employees’ retirement benefit costs and special education, school lunch programs and “best practices” incentive payments. The foundation allowance component did fall, from $8,799 per pupil in 2010-2011 to $8,359 per pupil in 2013-14, but in total Novi schools received substantially more dollars per student from state taxpayers in 2013-2014 than three years ago. The tale is similar in the other three districts cited in the Schauer ad. Lincoln Consolidated Schools saw its total per-pupil funding from the state increase from $6,819 in 2010-11 to $7,727 in 2013-14. State funding to the Ann Arbor district jumped from $5,215 per student in 2010-11 to $5,626 in 2013-14. The Plymouth Education Center charter public school saw its per pupil funding from the state increase from $7,691 in 2010-11 to $7,773 in 2013-14. Here are the most recent figures (2012-2013) for how much each school district received per student when all funding sources including federal dollars are included: $10,454 to Novi; $10,104 to Lincoln Consolidated; $11,460 to Ann Arbor; and $8,434 to the Plymouth Education Center. Statewide, the number of state dollars spent on K-12 education has increased every year Gov. Snyder has been in office, rising from $11.01 billion in 2011-12 and $11.21 billion in 2012-13 to $11.60 billion in 2013-14, according to the Senate Fiscal Agency. Why Do Michigan Residents Falsely Believe Education Spending is Down?